We are in the third week of classes, but our “wet” lab work started this week! After spending some time on our experimental plan and designing primers, this week I was able to make a lot of Danieau’s (many, many liters of it), a buffer for our zebrafish. I learned some techniques important for maintaining the lab, namely how to use the autoclave properly. 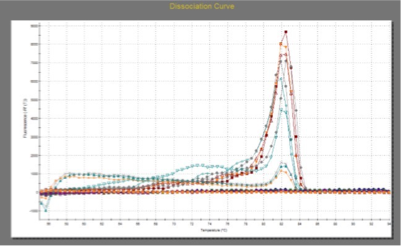 I was also able to test my primers and get a successful dissociation curve after a few tries for 3 out of 4 primers that I was testing. Thankfully, I only needed one set of primers for each of the two genes I was looking at, so 3 out of 4 is a success. I ran out of cDNA early on, so I got some practice in making some from zebrafish RNA that we had lying around. With our rudimentary experimental plan outlined, we are ready to proceed to dosing our embryos and performing RNA isolations to see how our housekeeping genes are affected by our chemical treatments. If all goes well, we will use these housekeeping genes and their values to normalize our fold change data. We’ll be looking at antioxidant genes that are thought to be regulated by our transcription factor of interest, Nfe2. By looking at the expression of these antioxidant genes in zebrafish embryos that have been treated with or without chemical and have had nfe2 knocked down or not, we can look for changes in expression and postulate a role of nfe2 based on the data we collect. For next week, I’ll be practicing RNA isolation with phenol as well as collecting data for our housekeeping genes. It’ll be a busy week while we optimize breeding, figure out each others schedules, perform log fold dilutions of cDNA to check our primer efficiency, as well as collect qPCR data on our housekeeping genes. The biggest lesson I learned this week was to never rush an experiment, and I found out the hard way by repeating a qPCR three times until I got usable data. Moving forward, I’ll be making sure to give myself an ample amount of time in lab to complete my experiments, as well beginning to write my year long thesis. All in all, working at MDIBL this summer was an invaluable experience and has provided me with quite a head start for my thesis in terms of lab know-how as well as my knowledge on our topic of interest, the role of nfe2 in the oxidative stress response in zebrafish embryos throughout development.